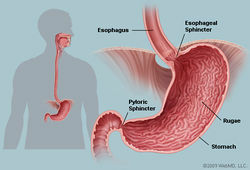 The Stomach is very important for digestion and maintaining overall health in the body. The stomach is an important organ of the digestive system that is able to expand significantly to hold food and liquids that are swallowed. It also muscular and churns food into a substance called chyme after secreting digestive juices to aid in their breakdown. While it is important for keeping us healthy, it can also cause many diseases. The stomach is a fascinating organ and has been studied for many years. These are the different areas in the stomach. This image highlights the fundus, body, and antrum. This picture shows the different layers of tissue that are in the stomach. The main functions of the stomach are food storage, digestion, and protection. For example, when food contains harmful organisms (bacteria and other micro-organisms) or chemicals the stomach helps to get rid of them. Alcohol and Aspirin are two exceptions that can enter through the stomach walls and into the bloodstream. The first part of digestion is mechanical digestion. In this part of digestion the stomach breaks down food into a liquid form called chyme. The second is chemical digestion. During this process large molecules are being converted into smaller ones. Through these two processes the body gets its essential needs from the foods that humans eat. The word stomach comes from the Greek word stoma, which means mouth. Many people who studied the stomach in ancient times were correct with their predictions of the stomach's purpose and function. They were aware that it was extremely necessary in human life. Some anatomists concluded that the stomach could think for itself and that is why people are aware when they are hungry. Throughout the eleventh century Avicenna made the connection from the stomach to the diet of a person. He realized that diet and activity directly affected feelings in the stomach and the overall health of someone. As more dissections began to occur throughout the eleventh and twelfth the anatomy became more clear. It was decided that the stomach was a cold and dry organ that was the shape of a bean about the size of the average humans fist. It also increased knowledge on the stomach's part in digestion. Many anatomists throughout the fourteenth to the seventeenth centuries thought that the spirit and the body were separate. They thought that body organs that did not have a spirit were not necessary to the body. This theory was quickly disproved. Leonardo da Vinci began to make the conclusion that stomach was not only correlated to digestion, but also to respiration. Throughout time, with technology and experiments, many different ancient theories have been disproved. We know more than they did then, and the future will know more than we do. The stomach is extremely important in the health of humans and is responsible for many different processes. 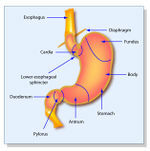 ↑ Structure and Function of the Stomach. elu.sgul.ac.uk. Web. 15 October 2014 (Date-Accessed). ↑ 2.0 2.1 Taylor, Tim. Stomach. innerbody.com. Web. 15 October 2014 (Date-Accessed). ↑ 3.0 3.1 Marais, Monique. The Function of the Stomach. health24.com. Web. 24 June 2014 (Date-Published). ↑ Structure and Function of the Stomach. elu.sgul.ac.uk. Web. 15 October 2015 (Date-Accessed). ↑ Diseases of the Stomach and Duodenum MUSC Health. Web. October 27,2014 (date accessed). ↑ Gastritis MUSC Health. Web. October 27,2014 (date accessed). ↑ Gastroparesis MUSC Health. Web. October 27,2014 (date accessed). ↑ Gastric Cancer MUSC Health. Web. October 27, 2014 (date accessed). ↑ Mayo Clinic Staff. Viral Gastroenteritis Mayo Clinic. Web. October 27, 2014 (date accessed). ↑ Stoma dictionary.com. Web. October 27,2014 (date accessed). ↑ History of the Stomach and Intestines stanford.edu. Web. October 27,2014 (date accessed). This page was last modified on 29 October 2015, at 19:14.